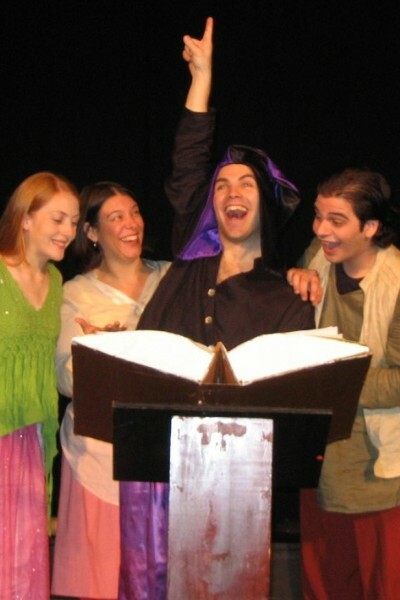 "The king of an ancient land commands the town storyteller to mesmerize him with a story. If she fails in her attempt, she faces banishment! With this weighty task before her, Scheherezade transforms each of the townspeople into actors and recruits them into acting out the story of Aladdin. His discovery of the magic lamp leads him into a wild, funny and exciting coming-of-age adventure, featuring a gregarious genie, an evil magician, a villainous father and his wimpy son, and, naturally, a lovely, street-smart Princess. Of course, the original story is here, but thanks to Neary’s clever wordplay, ingenious stage sense and farcical flair, it’s fast, witty, and surprisingly contemporary." Well, okay. I’ll buy that. The setting is the court of the King of some unnamed foreign land in some undetermined era. Once the story begins, the people of the court create the story settings from whatever material is available in the court.